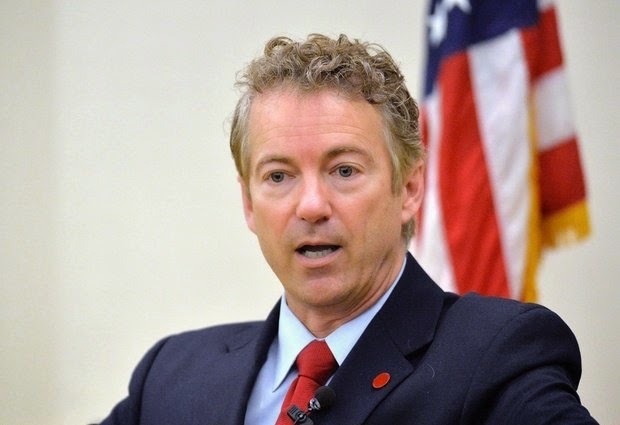 In this Nov. 21, 214 file photo, Sen. Rand Paul, R-Ky. speaks in Highland Heights, Ky. Paul hinted in an interview Friday, Dec. 5, 2014, that he smoked marijuana in his youth, adding that voters should not confuse his push for reduced criminal penalties for drug offenses as an endorsement of drug use. HIGHLAND HEIGHTS, KENTUCKY. (AP) — Kentucky Sen. Rand Paul hinted in an interview Friday that he smoked marijuana in his youth, adding that voters should not confuse his push for reduced criminal penalties for drug offenses as an endorsement of drug use. Paul, who announced plans this week to seek re-election to the Senate in 2016 and is actively exploring whether to run for president, said he "wasn't a choir boy" when asked by Louisville television station WHAS if he had used marijuana while in college. "Let's just say I wasn't a choir boy when I was in college and that I can recognize that kids make mistakes, and I can say that I made mistakes when I was a kid," Paul said in an interview broadcast Friday night. "I think drugs, marijuana included, aren't good for you," Paul said. "I don't want to be someone who is seen as being this person advocating for drug use. I think they're not a good idea." The recreational use of marijuana is legal in two states and voters in two more plus the District of Columbia have approved legalization as well. Paul told a group of law students at Northern Kentucky University last month he would not support lifting the federal ban on marijuana use, but said he did not want the federal government to try and overturn state laws that have made the drug legal. Paul told WHAS he has focused on reducing criminal penalties for some nonviolent drug offenses, which he said have been administered unfairly and disproportionally impact the nation's minorities. He noted that the past three presidents "either admitted or skirted around the issue" of using illegal drugs in their youth. "If they had been poor or lived in poverty or lived in one of our big cities where there are a lot of (police) patrols, there's a good chance none of them would have ever excelled," Paul said. "So I have a great deal of personal sympathy for people who have made mistakes as a young person." Paul said in the interview a decision on whether to run for president was still months away. However, he said any potential presidential campaign would include Jesse Benton, his 2010 Senate campaign manager, who resigned from Sen. Mitch McConnell's re-election campaign earlier this year after an Iowa state senator pleaded guilty to federal charges stemming from Paul's father's 2012 presidential campaign. Benton, who served as former Rep. Ron Paul's campaign manager in 2012, has denied any wrongdoing and has not been charged. In that case, former Iowa state Sen. Kent Sorensen allegedly accepted thousands of dollars to switch his support to Ron Paul before the 2012 Iowa caucuses and lied to federal investigators about the money. "Jesse is married to my niece and was a big help in the Kentucky election here in 2010 and a big help for Sen. McConnell. Yes, he'll help us," Rand Paul said, adding he did not think Benton "did anything wrong."